Kickboxing: it sounds scary, but it is actually just a great workout. At Seung-ni Fit Club, we are committed to giving you the best kickboxing workout in town. Kickboxing combines intense cardio activity with martial arts create an exciting and fun workout. At Seung-ni Fit Club, we keep our kickboxing classes fresh and new by mixing it up every class. Through a series of kicks, knee strikes, and punches, we take our kickboxing classes to the next level of fitness. Kickboxing makes you look and feel tough while burning fat and building muscle. If you are looking for a solid workout without the boring repetition, kickboxing may be for you. We at Seung-ni Fit Club take pride in providing a non-judgemental and welcoming environment, and one that is reflected in every single one of our classes, including kickboxing. 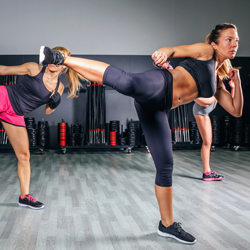 You will find everyone from 18-year-olds to grandparents in our kickboxing classes, as it is an awesome fitness routine for anyone and everyone! We employ only the best instructors and put them through rigorous training in order to make sure they can help you get the best workout possible, every time you come into our facilities. We want you to feel tired, but excited every time you leave our kickboxing classes – tired, because you worked crazy hard, and excited because you know you’re making the right health and fitness choices for your life (and because the endorphins are flowing). If you have any questions about our kickboxing classes, contact us today!